KUMD is a proud sponsor of the Mental Health Awareness Concert presented by letstalkmn.com. 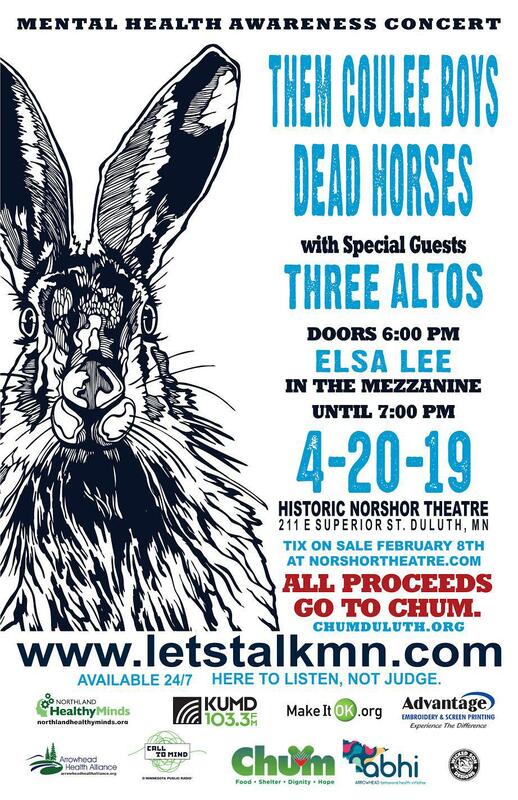 The concert will feature Them Coulee Boys, Dead Horses, Three Altos and Elsa Lee and will take place at the NorShor Theatre on Saturday, April 20th. All proceeds will go to CHUM. We were happy to welcome this young bluegrass trio, originally formed in Oshkosh, Wisconsin but now based in Milwaukee, back to our studios on November 17, 2016. Since their last visit they've toured steadily, played numerous festivals, and released a critically-acclaimed third album, Cartoon Moon. They performed the same night at the Red Herring Lounge in Duluth. Listen to our session with this young bluegrass-influenced band from Oshkosh, Wisconsin from March 6, 2015. They recently released their second album, Space and Time. Dead Horses perform a few songs and talks about their latest album.